Can Financial Data Entry Prevent Recession-like Situations? Home / Outsourcing / Can Financial Data Entry Prevent Recession-like Situations? Precise and well-timed financial analysis will make a solid foundation for businesses and the stock market. Having a perfect financial data entry system in place can enhance stock market stability. It assumes greater significance in light of the recent suggestion by the International Monetary Fund that central banks all over the world should act as “market makers” in financial crisis conditions. While analyzing the stock market performance, the first thing that has to be analyzed is the relationship between investment risks and data management. Stocks and securities involve a continuous stream of financial data and any errors in data management can cause mayhem in the market and confusion in the minds of the investors. 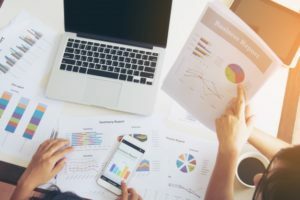 Economic experts are highlighting the importance of financial data entry and bringing it to the public attention to avoid a repeat of market volatility prevailing since 2008. For instance, “High-Frequency Trading” is based on rapid data analysis using financial algorithms. But not many people tried to analyze whether the data is right or not. An ideal stock market can quickly match both buyers and sellers. However, in the event of a market crash, stock traders often make a retreat and shy away from making reasonable bids. Thus in the absence of serious buyers, stock prices drop rapidly. The traditional role of a “Market Maker” is to always ensure a fair combination of buying and selling prices. However, computer trading has changed everything. The International Monetary Fund has recommended that the world’s central banks step in as market makers during such eventuality by using the financial resources of the central banks to stabilize the markets. Are Global Financial Risks difficult to spot? The changing profile of financial risks for stock markets means that central banks could only be the institutional entities that are capable of taking quick and corrective action to prevent stock market crashes. However, the European Central Bank and the U.S. Federal Reserve have opined that relying on central banking authorities have their limitations. However, accurate and timely financial data entry system can reduce the problems in stock markets. In drastic situations, banks could create enough funds to buy all outstanding stocks and bonds. Most market crashes happen because of a lack of order in the market and over-valuation of the underlying investments. Be it gold to stocks to real estate to oil, any market may crash in the absence of a systematic order in the transactions. Financial stability is a key factor for both investment markets and commercial enterprises. Financial data entry process can go a long way in helping businesses to be stable. Businesses can adopt a sound financial data entry system. By outsourcing data management to well-experienced outsourcing partners and stay safe from the pitfalls in the market. Having the right data will help businesses to make well-informed decisions or even forecasts that pay off. If you are looking for a reliable financial data entry system, Data Entry India Outsource will make a great choice. We have the requisite technology and expertise to handle all types of financial data entry tasks and come up with bespoke reports that match your needs. Call us to get started.